This city owes its present regularity and beauty to a fire which almost totally destroyed it in 1763 ; after which the empress Catherine II. ordered it to be rebuilt on a uniform plan. Some houses are of stone, but the greater part are of wood; and the paving is mostly of the same material. An impost is levied upon every horse that passes the gates, expressly to pave the streets. 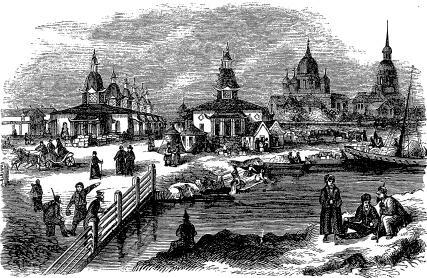 Tver is a place of considerable trade, a large part of its population being merchants, or engaged in the navigation of the Volga. 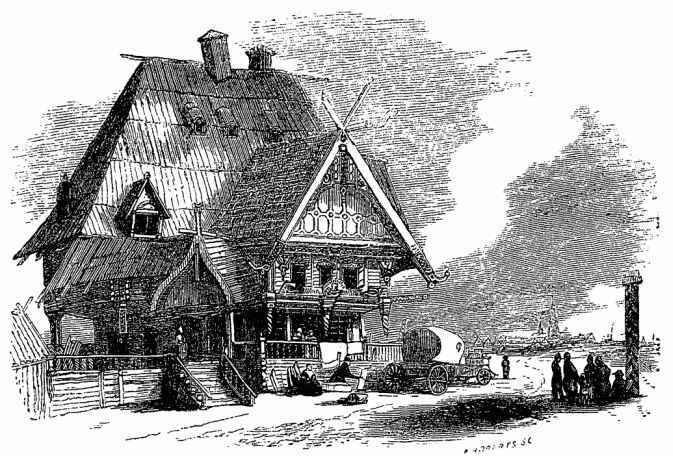 It is an entrepot for grain from the south destined for St. Petersburg, and for goods conveyed overland to and from Riga. It is of considerable antiquity, having been the capital of a principality as early as the middle of the thirteenth century. The town has frequently suffered from the plague, and been taken by both the Tartars and Poles ; but it has remained, with little interruption, attached to the dominion of the Russians since 1490. The government of Smolensk lies between the fifty-third and fifty-seventh degrees of north latitude, and the thirtieth and thirty-sixth degrees of east longitude, having the governments of Pskov and Tver on the north, Moscow and Kalouga on the east, Vitepsk and Moghilev on the west, and Orel and Tchernigov on the south. It comprises an area of about twenty-one thousand square miles. The surface of this government is mostly an undulating plain, in some parts marshy; in the north is a more elevated plateau, in which the Dnieper and several other rivers have their source. The soil is generally fertile, and more grain (principally rye) is grown than is required for home consumption. Hemp, flax, tobacco, and hops, are cultivated. Cattle-breeding is less attended to; but a good many hogs are reared. The forests are very extensive, and are, in fact, the chief sources of wealth. Game is very plentiful; and bees are reared almost everywhere. Iron, copper, and salt, are found. Its manufactures are few, being nearly confined to leather, glass-wares, pitch, &c.; with sawing-works, distilleries, and a few carpet-factories, in the capital. The raw produce of the government is exported, in large quantities, to Riga, Wilna, and Moscow. Smolensk, the capital of the government, is situated on the Dnieper, two hundred and thirty miles west by south from Moscow. This city is of considerable antiquity. It was, in the ninth century, in a flourishing state, and independent until the year 881, when it submitted to Novgorod. Its population at the present time is about thirteen thousand. It lies on both sides of the river, and is surrounded by a massive wall, flanked with towers. It appears to advantage at a distance, but is in reality a poor town, the houses being mostly of only one story, and built of wood; though since it was burnt by the Russians, previous to their evacuation of it in 1812, it has been partially rebuilt of stone and brick. The fortifications, however, remain pretty much in the same state as when Napoleon left them. Large apertures made in the walls have never been repaired, and the inhabitants seem poor and miserable. Here the French army, retreating from Moscow, had expected to rejoin the divisions left on the Dnieper and the Duna, and find their stores; but on their arrival they learned that Napoleon had altered his plans, that the ninth corps had not even halted in Smolensk, and that the provisions were all consumed. " A thunderbolt,'' writes Labaume, " falling at our feet, would have confounded us less than did this news; the little that remained in the magazines was, in spite of the guard, pillaged by the famished soldiers, who would not wait for the regular distribution of their rations. This pillage led for the moment to abundance. At the unexpected view, our hearts once more expanded. One laughed with joy as he kneaded his bread, another sang as he cooked his meat; but most of our party, eagerly seizing the brandy, quickly caused the wildest gayety to succeed to the most distressing sadness." On the 14th of November, 1812, Napoleon held here his first council of war. An iron pyramid has been erected in the city to commemorate the resistance made by the place to the French on the occasion above referred to. The city has three cathedrals, in one of which is a bell weighing forty thousand pounds; twenty Greek churches, three convents, a Lutheran and a Roman catholic church, a seminary, gymnasium, a military school for nobles, several hospitals, and carpet, hat, soap, and leather factories. A singular incident in Polish history is associated with this city. In the frequent wars between Poland and Russia during the middle ages, Smolensk fell into the hands of the former, whose victorious legions, forgetting their own country and kindred, held the city captive several years, abandoning themselves to riot and debauchery with the Russians. Being thus deserted by their husbands, great numbers of the Polish women married the serfs on their estates, and armed them for defence. The intelligence of these acts soon reached Smolensk, and the infuriated Poles commenced their homeward march, breathing vengeance. A great battle was fought near Warsaw, in which the serfs, encouraged by the women, were the victors, and the differences in question were settled by a compromise. The government of Moscow (Slavonic, Moskva) lies between the fifty-fifth and fifty-seventh degrees of north latitude, and the thirty-fifth and thirty-ninth degrees of east longitude, having the government of Tver on the north and northwest, Smolensk on the west, Kalouga and Toula on the south, and Vladimir and Riazan on the east. It is of a very compact and somewhat circular form; its greatest length from northwest to southeast is one hundred and forty miles, and its greatest breadth one hundred and ten miles. It comprises an area of about eleven thousand five hundred square miles. The surface of the country is generally low, but undulating. No mountain occurs, and scarcely anything deserving the name of hill. The principal heights are the river-banks, many of which rise considerably above the channel, and occasionally form very pleasing and picturesque scenery. The whole government belongs to the basin of the Volga, which, however, drains only a small portion of the north directly, the rest of the drainage being conducted into it by the Oka, and its tributaries the Kliasma and Moskwa. The tributaries of these streams, within the government, though small, are numerous. The only navigable streams are the Oka, Moskwa, and Kliasma. The climate is said to be temperate; but the range of the thermometer far exceeds that of the same latitude in western Europe, and the winter cold is extreme. The soil is only moderately fertile, and does not produce more grain than supplies two thirds of the consumption. More than one half of the whole surface is occupied by wood, and the wants of the capital cause no inconsiderable portion of ground to be occupied with gardens and orchards. The pastures also are extensive, and great care and skill are displayed in the rearing of both cattle and horses. No metals are wrought; but freestone, limestone, gypsum, and potter's clay, are obtained. Large masses of granite, not forming part of the strata, but in the form of boulders, are scattered over the surface, and are turned togood account. All kinds of textile manufactures are carried on to a great extent in this government, and give employment to a population at once more dense and more industrious than exists within the same space in any other part of Russia. Not only in towns, but in hamlets, and in almost every cottage, the sound of industrial employment may be heard. Almost all the inhabitants belong to the Greek church. For administrative purposes, Moscow is divided into thirteen districts. The city of Moscow, the ancient capital of the empire, and the present capital of the government, will be found fully described on future pages. The government of Yaroslav (Slavonic, Jaroslavl) lies chiefly between the fifty-seventh and fifty-ninth degrees of north latitude, and the thirty-seventh and forty-first degrees of east longitude, having the governments of Novgorod and Vologda on the north, Kostroma on the east, Vladimir on the south, and Tver on the west. Its length from north to south is about one hundred and sixty miles, and its greatest breadth is nearly the same. It has an area of about seventeen thousand square miles. The surface of the country is almost wholly flat, being only occasionally broken by the high banks of its streams, or by low ridges ; in some parts it is marshy. It wholly belongs to the basin of the Volga, which traverses the government in its centre; the other chief rivers are its tributaries the Mologa, Sheksna, &c, all of which have, more or less, an easterly direction. The lake of Rostov, in the south, is eight miles long by six broad, and there are nearly forty other lakes of less size. The air is pure, and the climate healthy, though the winter is severe, and the summer comparatively short. The soil is only moderately fertile. Rye, barley, wheat, oats, peas, &c, are grown; and Schnitzler estimates the annual produce of grain at about three millions of chetwerts :* a quantity insufficient for the inhabitants, who are partly supplied from the adjacent provinces by means of the Volga. Its hemp and flax are excellent, and cherry and apple orchards are numerous. The gardeners of Yaroslav and Rostov are famed throughout Russia, and many are met with at St. Petersburg. Timber is rather scarce. The rearing of live-stock, excepting horses, is little pursued; but the fisheries in the Volga are important. * A Russian " chetwert" is equal to 5.362 Winchester bushels. Its capacity, however, varies somewhat in different localities. This government is, however, more noted for its manufacturing than its rural industry. Linen, cotton, and woollen stuffs, leather, silk, hardware, and tobacco, are the principal manufactures: but, independently of these, the peasants are almost everywhere partially occupied with weaving stockings and other fabrics, and making gloves, hats, harness, wooden shoes, and various rural implements. Commerce is facilitated by several navigable rivers and good roads. Yaroslav is subdivided into ten districts ; the chief towns are Yaroslav, Rostov, and Ouglitch. Its population is Russian; and the women are proverbial (among Russians) for their beauty. Only about one seventeenth part of the inhabitants reside in towns. In respect of education, the government is comprised under the division of Moscow, and has numerous public schools and several ecclesiastical seminaries. The city of Yaroslav, the capital of the above government, is situated on the Volga, at the mouth of the Kotorosth, two hundred and twelve miles northeast of Moscow. It is well built, though mostly of wood; and is defended by a fort at the confluence of the two rivers. In its broad main street, which is ornamented with trees, are many handsome stone houses; and three convents and numerous churches contribute to give Yaroslav an imposing appearance. The Demidoff lyceum in this city, founded in 1803, has a good library, a cabinet of natural history, a chemical laboratory, and printing-press, and ranks immediately after the Russian universities. It was originally endowed with lands, to which thirty-five hundred and seventy-eight serfs were attached, and with a capital of one hundred thousand silver roubles; since which it has received other valuable benefactions. The same educational course is pursued as in the universities, and lasts three years. The establishment is placed under a lay-director and an ecclesiastic, and has eight professors, two readers, and forty professionary students. Yaroslav has also an ecclesiastical seminary, with five hundred students. 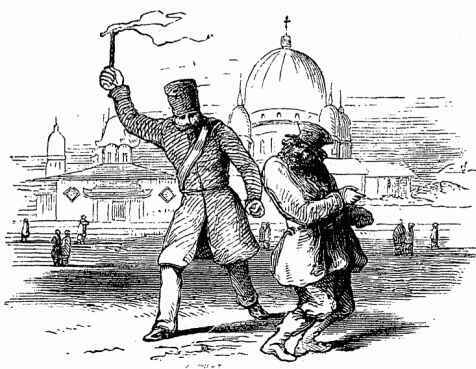 A large stone exchange (Gostinoi dvor), a hospital, foundling-asylum, house of correction, and two workhouses, are the other chief public edifices. This city is the residence of a governor, and the see of an archbishop. It has about forty different factories, including three of cotton, four of linen, and two of silk fabrics, eight tanneries, and several tobacco, hardware, and paper-making establishments. Its leather and table-linen are much esteemed. The position of Yaroslav on the Volga contributes to promote its commerce, which is very considerable. Its manufactures are sent to Moscow and St. Petersburg, and a great many are sold at the fair of Makariev, in the government of Kostroma. Two annual fairs are held in Yaroslav. This is a city of considerable antiquity, being founded in 1025, by the famous Yaroslav, son of Vladimir the Great, who annexed it to the principality of Rostov. It fell under the dukes of Moscow in 1426. Peter the Great was the first to give it commercial importance, by establishing its linen manufactures, since which its prosperity has been progressive. The population of the city is about thirty thousand. The government of Kostroma is situated principally between the fifty-seventh and fifty-ninth degrees of north latitude, and the fortieth and forty-eighth degrees of east longitude, having the government of Vologda on the north, Yaroslav on the west, Vladimir and Nijnei-Novgorod on the south, and Viatka on the east and southeast. Its greatest length is two hundred and seventy miles, and its breadth one hundred and seventy miles. It has an area of about thirty-eight thousand square miles. The country consists of wide, level plains, varied only by gentle acclivities and elevated river-banks. The northern part is cold, humid, and swampy. Many of the swamps are covered with wood, and some of them contain bog-iron ore. What is arable is cold, and of indifferent fertility. Occasionally there are considerable extents of healthy ground, partly covered with wood. The southern part, near the Volga, has an opener and drier soil, consisting mostly of clay, loam, and sand, but still only of moderate fertility. The climate is severe: the winter is long, and the weather stormy; the summer is short, and is frequently misty. The chief river is the Volga, which, shortly after entering the government in the southwest, is joined by the Kostroma from the north; then, after a short turn to the south-southeast, proceeds almost due east, when it receives its important tributary the Unga, and soon after, by a southerly course, quits the government. There are numerous lakes. Of these, the Galitz is ten miles long by five and a half broad, and the Tchuchloma is above five miles in diameter. Many of the houses in this government, and indeed through all the south and east of Russia, are constructed of timber, and have very peculiar forms. An interesting example of such structures is shown in the accompanying engraving. Large quantities of hemp and flax are raised in this province. These two crops form an important element in providing employment for the inhabitants. Indeed, the governments of Yaroslav and Kostroma may be considered as the chief seats of manufacturing industry, from which eastern Europe derives its supplies. Damask and linen weaving, with the numerous processes connected with them, give employment to a large population, in both the towns and throughout the district. Russia leather, also, both red and black (the former of cow, the latter of horse hide), is made in large quantities, and of first-rate quality. The bog-iron raised is usually smelted by the inhabitants themselves in small furnaces, and formed into the various implements required for their own use. The forests, scattered over the district, employ many hands in felling trees, cutting them for timber, firewood, or charcoal. Even the bark of the lime-tree is turned to profitable account, being largely employed in making mats, for which the district has long been celebrated. The fishing, also, is very productive. Many of the peasants are masons, carpenters, &c., who seek for employment in the summer season in the contiguous governments, returning home in the autumn. The city of Kostroma, the capital of the above government, is located on the Volga, at the confluence of the Kostroma with that river, two hundred miles northeast of Moscow. The population of the city is rising twelve thousand. It is of great antiquity, having been built in the twelfth century, and, as is usual with old Russian towns, is surrounded by a rampart of earth, of which advantage has been taken to form a promenade. Its situation is elevated and agreeable, and, being the seat of both the civil and military government of the district, it contains a great number of public buildings, which, together with most of the dwellings, are constructed of stone. It has fifty churches, a monastery, an ecclesiastical college, a gymnasium, and a large stone building, or bazar, for the security, exhibition, and sale of merchandise. Its manufactures, among which that of Russia leather has long been famous (and including also those of linen, Prussian blue, soap, and tallow, a bell-foundry, &c), make Kostroma oneof the most important towns on the Yolga. Several fairs are held here, which are numerously attended by the merchants and country-people. Nijnei-Novgorod, or Lower Novgorod (vulgarly, Nijegorod), is situated in the central part of European Russia, on both sides of the Volga, between the fifty-fourth and fifty-seventh degrees of north latitude, and the forty-first and forty-seventh degrees of east longitude. On the north is the government of Kostroma; on the east, Kazan and Simbirsk; on the south, Penza and Tambov; and on the west, Vladimir. Its length from north to south is one hundred and eighty-five miles, and its greatest breadth one hundred and thirty-six miles, comprising an area of about twenty thousand square miles. The surface of the country is flat, or gently undulating. The soil, which consists principally of sand and black friable mould, is exceedingly fertile; and being (for Russia) well cultivated, this is one of the most productive provinces of the empire. Exclusive of the Volga, several of its affluents, including the Oka, Betlouga, Piana, &c., traverse different parts of the government, which is well watered, at the same time that it is not marshy. There are some very large forests, those of the crown amounting to about thirteen or fourteen millions of acres. The produce of the grain-crops considerably exceeds the consumption. Hemp and flax are very extensively cultivated. Great numbers of cattle and horses are bred, and the imperial government is taking the most effectual measures to improve the latter. This is a considerable manufacturing as well as a rich agricultural district. Coarse linen, canvass, and cordage, are the principal manufactured products; there are also some iron-works, with numerous distilleries and tanneries, soap-works, glass-works, &c. Its commerce is extensive and growing. The exports consist of grain and flour, cattle, horses, leather, and tallow; the manufactured articles specified above, with iron, timber, potash, mats, glass, &c. In carrying on this trade, vast advantages are given by the central position of the government, and its rivers and canals. Nijnei-Novgorod (Nijegorod, or Njnii), the capital of the above government, is situated in the angle formed by the confluence of the Oka with the Volga. Its stationary population is about forty thousand. It stands partly on a steep hill, about four hundred feet in height, the summit of which is occupied by the Kremlin or citadel, and partly on the low ground along the sides of the rivers. The citadel, from the ramparts of which there is a noble view of the Volga, Oka, and surrounding country, contains the government-offices, two cathedrals, built after the model of that of Moscow; an obelisk, seventy-five feet in height, erected in honor of the deliverers of their country, the patriotic citizen Minin and Prince Pojarski; and other public buildings. The upper part of the town has several good streets; and being ornamented by numerous churches, placed in conspicuous situations, has an imposing appearance. The lower town consists principally of a very long street, bordering on the Volga. 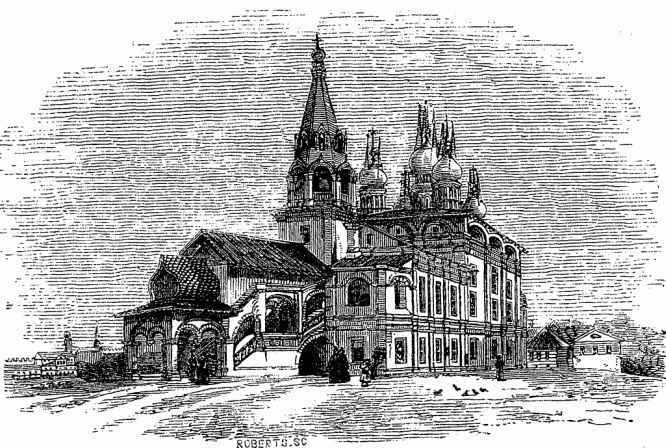 With the exception of the principal public buildings (including the elegant church of the Holy Women, shown in our engraving), and a few private houses, the rest of the city is constructed of wood. Among the establishments are three convents, a bazar, a gymnasium, and four primary schools, an ecclesiastical seminary, and a large military school. The town is ancient, having been founded in 1222. The Kremlin was surrounded by strong walls and towers in 1508. A bridge of pontoons leads across the Oka to the splendid new bazars erected on the left bank of that river for the exhibition and sale of fmer-chandise brought to the fair. These, which are divided into parallel rows, or streets, are constructed of stone, roofed with iron, having covered galleries in front, supported by eight thousand iron pillars. They are built on piles, and, to guard against the danger of inundation, the ground on which they stand was raised about twenty feet. Being enclosed on three sides by canals, and on the fourth by a navigable inlet of the Oka, there is every facility for the delivery and shipment of merchandise. The establishment is of very great extent, comprising above twenty-five hundred booths ; and is admitted on all hands to be at once the largest and most perfect of its kind that is anywhere to be met with. Including the church, dedicated to St. Macarius, the patron-saint of the fair, it is said to have cost in all about eleven millions of roubles. Nijnei-Novgorod has various manufactures, but it owes its great importance almost entirely to its commerce. It is the grand entrepot for the trade of the interior of the empire, and has, in fact, a greater command of internavigation than any other city of the Old World. Besides the grain, cattle, and other products of the surrounding country, the Kama, the principal affluent of the Volga, conveys to Nijnei the salt of Perm; the gold, silver, copper, and other metallic treasures, of the Ural mountains; the furs, &c., of Siberia; and even the teas of China. The silks, shawls, and other merchandise of central Asia, and the fish, caviar, &c., of southern Russia, come up the river from Astrakhan; while the manufactured goods of England and western Europe, the wines of France, the cotton of the United States, and the sugar of Brazil, are conveyed to her from St. Petersburg and Archangel, with both of which, as well as with Moscow, she is connected by navigable rivers and canals. These advantages, joinedto her situation in a fertile country in the centre of the monarchy, were so highly appreciated by Peter the Great, that it is said he at one time intended to have made Nijnei the capital of his empire; and it is, perhaps, to be regretted that he did not carry this project into effect. Latterly the commercial importance of Nijnei-Novgorod has been vastly increased. Previously to 1817, the great fair, now held here, was held in a less convenient situation at Makarev, in the same government, lower down on the Volga (which must not be confounded with Makariev, in the government of Kostroma, where fairs are also held). But the buildings for the accommodation of the merchants at Makarev having been accidentally burnt down in 1816, government took advantage of the circumstance, to remove the fair to Nijnei. It begins on the first of July, and continues for a month or six weeks, and is well known, not only over all Russia, but over most other countries of Europe and Asia. It is carried on within the bazars already noticed, which were constructed by government for the accommodation of the traders, to whom they are let at moderate rents. The produce disposed of is classified as follows, viz. : first, Russian produce, raw and manufactured; second, merchandise from the rest of Europe, consisting principally of manufactured and colonial products ; and, third, products of China, Bokhara, the Kirghizes, and other Asiatic nations. The concourse of strangers during the fair is quite immense; so much so, that the population is then increased, according to the lowest estimates, by from one hundred and fifty to two hundred thousand individuals. Here are seen dealers from India, China, Tartary, Bokhara, Persia, Circassia, Armenia, and Turkey; and from Italy, Poland, Germany, France, England, and even the United States. Theatrical representations, shows of wild beasts, and other diversions, are got up to entertain the multitude, but the engrossing spirit of trade overrides all considerations of mere amusement.
" To us, as strangers, the earnest, business-like appearance of the people was especially striking. There was evidently no time to be lost in merry-go-rounds or penny shows. Here fortunes were to be lost or won in a few short weeks. The rich merchant had brought valuable wares from distant lands at an enormous expense ; the poor peddler had trudged many a weary mile with his heavy pack: both had staked their all on the results of their transactions in the allotted time, and were in no humor to trifle with it. It had evidently never struck them that Nijnei fair was a place to which people would resort for either pleasure or instruction, or for anything but gold; and certainly, interesting though it was, some such motive as the last would be required to induce a second visit.
" The fair is held on a low, sandy spot of land, formed by the junction of the Oka and the Volga, and which is subject to constant inundation in winter. The substantial part of it, inhabited by the wealthy merchants, is arranged in twelve parallel streets, composed of neat two-storied brick houses, the lower part forming the shops and warehouses, which are protected by covered verandahs. Each street terminates at one end in a pagoda, indicating the Chinese quarter" (a representation of which is given on the opposite page) ; " while at the other it is connected with a square, where the governor's house and public offices are situated.
" Our abode was situated in a suburb, on the opposite side of the river, so that it was necessary to cross the bridge of boats every time we wished to visit the fair; and here the confusion was always the greatest. We were obliged to struggle our way, if on foot, amid sheepskins, greasy enough to scent us for the rest of our lives, thereby adding to the store of fleas with which we had started from our lodging. Women, with waists immediately under their throats, and petticoats tucked up to their knees, tramped it gallantly through the mud, and made better progress than we could. A Cossack on horseback rode up and down the bridge for the purpose of keeping order amid the droskies, which, heedless of the rules of the road, dashed in every direction, apparently bent upon splashing those they did not run over. Drunken men continually stumbled against us; and when at last we reached the slough on the opposite side, the confusion and hubbub were greater than ever. The mud in the shallowest parts was at least two feet in depth, and nearly everybody waded about in it with Russian leather jack-boots. Numbers of small shops surrounded the bespattered populace, while a few miserable attempts at shows only proved how little they were appreciated.
" 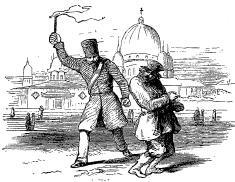 At the corners of the streets running into this delectable hole were stationed Cossacks, who showered blows upon offending Mujiks (or peasants) with their heavy-lashed whips, without regard to the nature of the offence or the size of the victim. Turning up one of these streets, and penetrating farther into the fair, other scenes and pleasanter forms meet the eye. The gay dress of the Georgian forms a pleasing contrast to the everlasting sheepskin; and, as we enter the shop of the Teflis merchant, beautifully-embroidered slippers, rich table-covers, and the finest silks, are spread out temptingly before us . . . . In the next shop are handsome furs and skins piled in every available corner, and the owner of the valuable collection stands at the door, his flowing robe and dignified demeanor betokening his eastern origin. Aaron was, in fact, a Bokharian Jew, who delighted to show us his costly wares, even though there was no chance of our becoming purchasers; and, finally, regaled us with almonds, split-peas, and raisins — flattered, perhaps, by the admiration we expressed at the belt he wore, the buckle of which, composed of solid silver, was set with turquoises. But it would be hopeless to attempt a description of the costumes of the different merchants and shopkeepers, or to enumerate the variety of articles exposed for sale.
" The Bokharians, Persians, and Georgians, inhabit one quarter, which is likely to prove the most interesting to the stranger; and I recognised, in the countenances of many of the representatives of these nations, a strong resemblance to some old Affghan and Persian horse-dealing friends. It is a convenient arrangement, no less for the sight-seer than the merchant, that the fair is divided into quarters, devoted to the sale of different merchandise. The Ketaiski Red, or Chinese division, is at once distinguishable by the rows of square leather boxes which contain the tea. No Chinaman, however, showed his pigtail in the crowd, much to our disappointment— the transfer being made at Kiahta, whence the tea comes overland to the Kama, down which river it is conveyed to the Volga. In the cutlers' quarter I was surprised to find so great a preponderance of Russian ware ; still Sheffield maintains its own, and the prices are much lower than in St. Petersburg: indeed, this is the case with all English or foreign goods, which, though subject to a most exorbitant duty on entering Russia, may be procured more cheaply here, on account of the comparative facility with which they can be exposed for sale. The guild dues at St. Petersburg are so high, that the merchant, after paying two thousand roubles (assignation) for his position in the first guild, and two or three thousand roubles more for his shop on the Nevskoi Prospekt, has but little margin left for his profits.
" The whole system seems most elaborately devised to destroy all enterprise, and to depress as much as possible the spirit of trade, in a country which naturally possesses it in but a very limited degree; and it must be long ere the resources of the country can be properly developed, while the government seeks its own aggrandizement regardless of the prosperity of the community — since the protection it affords to home manufactures, by the duty on foreign goods, is effectually neutralized by the expenses attendant upon the sale and manufacture of the home produce itself. At Nijnei, however, these difficulties do not exist: the only expense is house-rent; and thus it happens that foreign goods are to be procured more cheaply here than they can be at a seaport seven hundred miles nearer the country whence they come; and, in some instances, the manufactured articles of a Russian town some hundreds of miles distant, are to be found here exposed for sale at lower prices than in the very town where they have been produced — an anomaly which is quite in accordance with the political economy of the country. The palpable result of all this is, that the variety of goods brought to Nijnei for sale far exceeds what it would be were there not so many attendant advantages to counterbalance the expense of transport ; and the traveller has only to wander along the narrow, insignificant-looking streets of the fair, to find articles which he would be unable to obtain in the handsomest shops of St. Petersburg and Moscow." The government of Vladimir lies between the fifty-fifth and fifty-seventh degrees of north latitude, and the thirty-eighth and forty-third degrees of east longitude, having the governments of Yaroslav and Kostroma on the north, Nijnei-Novgorod on the east, Moscow and Tver on the west, and Ria-zan and Tambov on the south. It comprises an area of about seventeen thousand five hundred square miles.